I was sitting at work the other day, eating my delicious lunch under the shade of a large leafy tree when I was descended upon by eleven savage crows. My blood went cold and I feared for my life as these killers approached, their beady eyes fixed on mine. But they were not here for me, no – they were after something far more sinister. My KFC. I had occasionally seen them ripping apart Zinger boxes that they had pulled from a bin, so as far as I knew they would do the same to me. Anything to get their beaks on the 11 secret herbs and spices. I begged for mercy by offering the bird gods one of my wicked wings, when a horrible thought crossed my mind. By ravenously devouring one of their fellow birds, the crows were being cannibals. Is a crow eating a chicken morally wrong? Or is it more akin to a human eating a fellow mammal? Am I complicit in this disgusting bird cannibalism? If these crows were to discover that they were eating their own kin, I could have unknowingly kicked off a mass extinction event where all the birds in the world would devour each other in a desperate bid for survival. So many questions raced through my head – it was almost certainly the biggest philosophical nightmare to have ever existed. 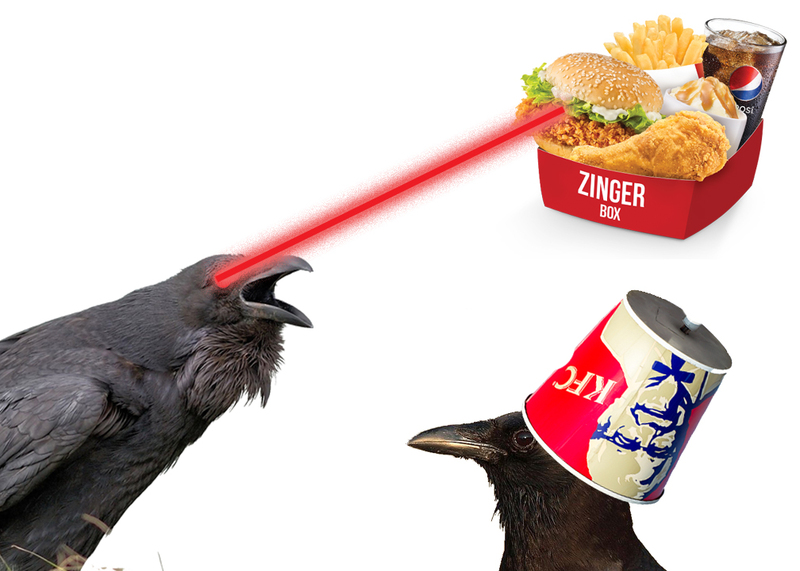 I quickly fumbled for my phone and did a quick google search, which revealed that crows are in fact omnivores. A wave of relief came over me, and I tried to absolve my sinful allowance of cannibalism by throwing some Zinger lettuce to cleanse their bird palates of the taste of delicious Kfry. The crows stared blankly at me and didn’t even budge at my offering – leaving me to suffer from my guilt. Previous Danger 5: Who’s Your Fuhrer?